As a nonprofit organization, the American Cancer Society must carefully control and manage expenses. And after an unexpected $1,200 audio conferencing overage fee, the organization began researching a way to reduce the costs and complexity of audio conferencing. 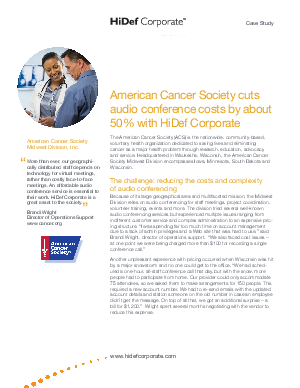 This new case study explores how HiDef Corporate™ from Citrix Online Audio enables the American Cancer Society to cut audio conferencing costs by nearly 50% – savings that bolster the organization's core mission. * Cut audio conferencing costs by 50%. * Streamline administration and billing. * Simplify conference management with Web Controls.